My rating in words: All-Time Favorite! Thanks to Dark Owl Fantasy for providing me with an ARC of this book in exchange for an honest review. This series. Wow. I can already say with a lot of certainty that it will be one of my top series of the year, and quite possibly, even of all-time. That’s right. OF ALL-TIME! I have just grown so incredibly attached to this world, this story and these characters. 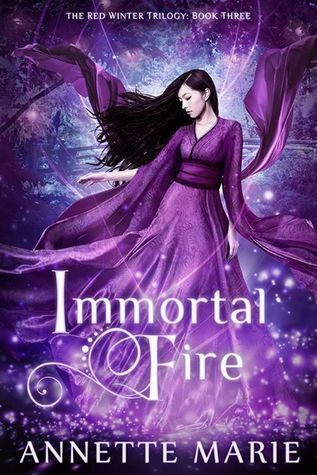 I had been eagerly awaiting this final installment, Immortal Fire, ever since finishing Dark Tempest and I can now confirm that it lived up to ALL MY EXPECTATIONS. This was the perfect ending to this series and I can’t quite gush about it enough. But I will try! First of all, this world! I already mentioned in my reviews for both Red Winter and Dark Tempest that the worldbuilding in this series is absolutely amazing, and this is no different for Immortal Fire. We are constantly learning new things and seeing new aspects to this world and though the mythology may be a bit complex and hard to get into at first, you’ll soon be fully immersed and in love. It is a gorgeous, well-developed and vividly described (not to mention beautifully illustrated) world that I’m still not ready to say goodbye to. The pacing in this series is also one of my favorites. I mean, there is so much going on, so much to do, so much action and so many epic scenes and still it is all balanced so perfectly with a few slower moments, moments of contemplation, character development and romance and I am so here for all of it! For me, this series was the perfect mix of a plot-driven AND a character-driven story. And talking about these characters, can I just mention (once again) that I am in love? All three main characters feel so real that they just jump off the page and their development, both as individuals and in relation to each other just gave me so many emotions. We have Emi, who may have become one of my all-time favorite heroines ever. Her development thoughout the entire series has been amazing and I have nothing but respect for her. Her fate has pretty much been sealed from the beginning, and this heavy burden could have turned her into someone else entirely, but she has grown into an incredibly strong, brave and mature young woman. Her fears and worries are very much present and real, but she handles everything with a grace and maturity that can only be admired. It is no secret I adore Shiro and I pretty much loved him from the moment we met him. But what could have been a one-dimensional character turned into such a deeply layered and complex guy. His journey throughout this series, and even before that, has been long and painful and shrouded in mystery, but with the end near and his powers and memories almost fully unlocked, we are left to wonder just who he will become exactly. Will he still be the lovable, teasing kitsune we have come to know and love, or will he turn into something ancient, powerful and completely different? His journey throughout the series is just as intriguing as Emi’s. And then there’s Yumei. Another character that could have been a walking, breathing stereotype, but Annette Marie fleshed him out so wonderfully and turned him into a fully fleshed-out and realistic character. In this final installment we learn more about his past and his motives. We get to see his relationship with the other characters develop more and I loved the contrast this stoic Prince of Shadows offered to the human, emotional Emi and the teasing, fun-loving Shiro. The friendship that has grown between all three of these characters pulled at my heartstrings throughout the entire series and I adored every single scene they had together. But of course, there’s also the romance aspect between Emi and Shiro, which has been the most delicious slow-burn throughout the series and which has finally exploded into a fiery ball of emotions here. I love a good angsty romance and this is one romance that will go down in history as one of my favorites. The ending is one big action-filled rollercoaster ride. The stakes are high, the war is on and the emotional impact is jarring. I spent the last 40% of the book alternating between fighting back tears (and failing at it) and holding my breath in suspense. But overall, I thought the ending was perfectly satisfying. We got the best possible ending to this amazing story and maybe even some room to return back to this world later for a new story. Or maybe that’s just because I’m still not ready to say goodbye. Thank you so much to Annette Marie for sharing this story with us! I know it will be one I will be re-reading again and again. “She threw her arms around Yumei. He staggered back a step holding his hands out away from her, as though he had no idea how an embrace worked. She pressed her face against his shoulder, tears streaking her cheeks. “Thank you, Yumei,” she choked. “She’s crying,” he growled at Shiro. Have you read the red winter trilogy? What did you think about it? I’m so jealous you’ve read this already – I’m counting down the days until I can finish this epic trilogy! So far I’ve loved it all the way! Really happy to hear you thought the ending was perfect! Oh nice! My library has the first 2 books so I’m hoping they get this one as well. If not, I’ll have to bug them so I can binge. 😀 Oh yea, I do plan on starting this trilogy this year. Brilly review! HAHAHAHAHAHHAHAH. I have ARCs for all three of them but I am still on Chapter 2 of the first book! Great review Lindsey! I think I can’t really say anything more because I haven’t yet finished this trilogy? AAAAAAH Prabhleen, I so hope you’ll enjoy the series!!!!!! !